Adrian Steel announces the release of new van products for the 2014 Transit Connect. A new product line of cargo management solutions for the 2014 Transit Connect is now available from Adrian Steel. A new product line of cargo management solutions for the 2014 Ford Transit Connect is now available from Adrian Steel. This new van equipment includes a steel partition, a wire partition, adjustable shelving, ladder racks, and trade packages. 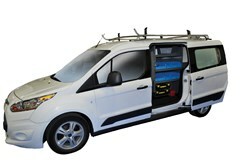 The new line of 2014 Ford Transit Connect van equipment is designed to help service professionals organize tools and equipment for increased effectiveness and productivity in both the long and short wheelbase Transit Connects. 2014 Transit Connect Steel Partitions: The P2TCS14 features all steel panels that safeguard the cab area against moving and shifting cargo. The recessed design allows for maximum adjustability of the front seats and provides storage space for a 6 foot step ladder in the back of the long wheelbase Transit Connect. The perforated window provides visibility of the cargo area and rear windows. The steel header and full perimeter wings provide optimal security and a high level of climate control and sound deadening. 2014 Transit Connect Wire Mesh Partitions: The P2TCFW14 provides maximum visibility yet still keeps cargo in the cargo area. The design of this wire mesh partition allows for maximum adjustability of the front seats. In addition, the recessed design provides storage space for a 6 foot step ladder in the back of the long wheelbase Transit Connect. The P2TCFW14 is lightweight and economical without sacrificing safety and security. 2014 Transit Connect accessories allow for van interior organization and customization. Blue bin systems maximize ADseries shelf space and allow for visual inventory management. Drawer units are stackable and feature the exclusive Lock ‘n Latch system. Drawer Components allow for the organization of small parts. Dividers and door kits optimize shelf space. ADseries Adjustable Shelving: ADseries shelving is exclusive to Adrian Steel. The only truly adjustable shelving platform on the market today allows the customer to easily reposition their shelves to where they need them to organize their tools and equipment. ADseries shelves are 44” high and available in 32” and 26” widths, and 12” or 14” depth options. Grip-Lock Ladder Racks: The Grip-Lock ladder rack is designed with a heavy-duty actuating arm to firmly grip ladder rungs which prevent shifting of the ladder on the rack. The gripping mechanism is lockable. Composite extrusions on front and rear crossbows and uprights are included. This is to protect the ladders from fatigue. Rung grips easily adjust to accommodate different types of ladders. 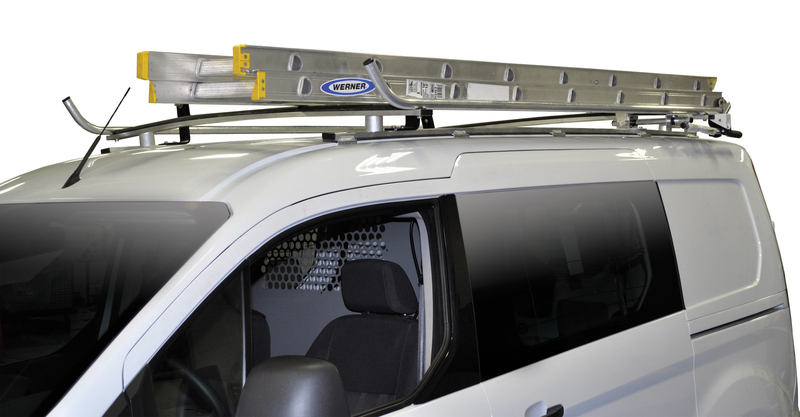 The Grip-Lock features an all-aluminum design to maximize the Transit Connect roof payload. The Grip-Lock accommodates a 24 ft. extension ladder on the short wheelbase and a 28 ft. extension ladder on the long wheelbase. Availability – Adrian Steel products for the 2014 Transit Connect are available at over 300 Adrian Steel distributors throughout North America or on a ship-thru basis at our new Baltimore facility for national fleets. Our goal is to optimize the value of the customer’s commercial vehicle by understanding the role of the vehicle in the customer’s business. Adrian Steel provides solutions for a range of vehicles from crossovers to cargo vans. Our customers include those with one vehicle in their fleet to 50,000 vehicles in their fleet. Adrian Steel has upfitted over 1 million vehicles in our 60 plus years in business and has leveraged that expertise in engineering our innovative product line. Adrian Steel’s installation network provides you options to get your vehicle upfitted regardless of where you need to get them done: at the factory, out of dealer stock, at your place of business, or through a bailment pool. Adrian Steel’s strong reputation in cargo management solutions is only matched by our resolve to offer the industry’s best lead times and highest quality.